^ Fragiska, M. Wild and Cultivated Vegetables, Herbs and Spices in Greek Antiquity. Environmental Archaeology. 2005, 10 (1): 73–82. doi:10.1179/146141005790083858. ^ McGee, Harold. Cilantro Haters, It’s Not Your Fault. The New York Times. 13 April 2010 [24 July 2012]. Some people may be genetically predisposed to dislike cilantro, according to often-cited studies by Charles J. Wysocki of the Monell Chemical Senses Center in Philadelphia. ^ Rubenstein, Sarah. Across the Land, People Are Fuming Over an Herb (No, Not That One). The Wall Street Journal. 13 February 2009 [24 July 2012]. ^ Lilli Mauer and Ahmed El-Sohemy. 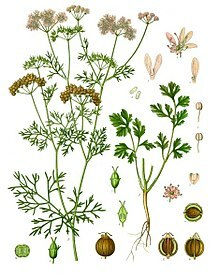 Prevalence of cilantro (Coriandrum sativum) disliking among different ethnocultural groups. Flavour. 2 May 2012, 1 (8). doi:10.1186/2044-7248-1-8. ^ Ewen Callaway. Soapy taste of coriander linked to genetic variants. Nature. 12 September 2012. doi:10.1038/nature.2012.11398. ^ Josh Kurz. Getting To The Root Of The Great Cilantro Divide. NPR. 26 December 2008. ^ Knaapila A1, Hwang LD, Lysenko A, Duke FF, Fesi B, Khoshnevisan A, James RS, Wysocki CJ, Rhyu M, Tordoff MG, Bachmanov AA, Mura E, Nagai H, Reed DR. Genetic analysis of chemosensory traits in human twins. Chemical Senses. 2012, 37 (9): 869–81. PMC 3589946. PMID 22977065. doi:10.1093/chemse/bjs070.